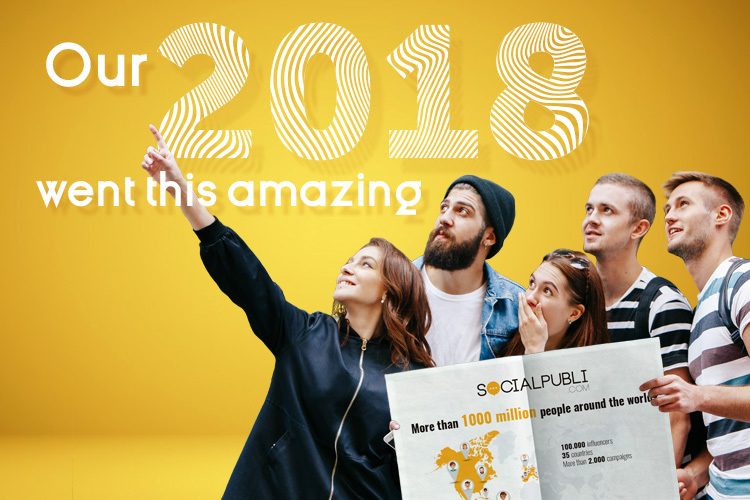 2018 was a great year for influencers, advertisers, and for SocialPubli. There were many new influencers who registered on our platform, we sent them more campaigns than ever, and they have shared the brands’ messages with large numbers of users on social media. Spain was becoming too small for our agency, so in 2018 we went to work to increase our influence around the world. We ended 2018 with more than 100,000 influencers, spread across 35 countries, with a reach of 1 billion people. Imagine how will things go in 2019! In addition to our offices in Mexico and Miami, we continue to be in touch with more influencers and more advertisers in Latin America and Europe. As Ismael El-Qudsi, CEO of SocialPubli.com, said ” We’re expanding a new advertising model into different markets, though a system of partnerships. This lets us offer brands global influencer marketing campaigns and, in this way, have their message distributed much more broadly, with original and personalize content. Their spokesperson is someone who is known locally in those different parts of the world. In Europe, we contacted experts in France and in Portugal, which also meant we could open the door to the Brazilian market. In Latin America, we expanded thanks to partnerships with RoHo in Peru and AdMediaRock in Colombia. Our CEO, Ismael El-Qudsi, has been talking about influencers in universities and at events like EShow, Enamorando al Consumidor (Loving the Consumer), BTMB, El Chupete, SEOontheBeach. Other more generalist media also shared his expertise, including Forbes, ABC, Cinco Dias. He has appeared on TV programs such as Camara Abierta, TVE news, and even on Salvame (Save me). SocialPubli.com attended many other events in order into expand our influence (and yours). We went to the Festival of Media in Rome, Collision, the Madrid Games Week (where we raffeled 60 admission tickets), WebSummit, SouthSummit (Mexico and Madrid)… and many more! And we were proud to once again win the eAward for Best Influencer Agency ! In addition to our continual improvements to the Platform, and our fight against fake followers, we’ve had a number of updates to the Platform which the Advertisers liked very much. Instagram was crowned the Queen of social media in 2017 and their reign continued in 2018, thanks to Stories. SocialPubli jumped ahead of other platforms in this space by offering automated campaigns using Stories. The campaigns can be set up in a matter of minutes. In addition to giving the messages a more authentic and personal touch, this also attracted quality traffic. 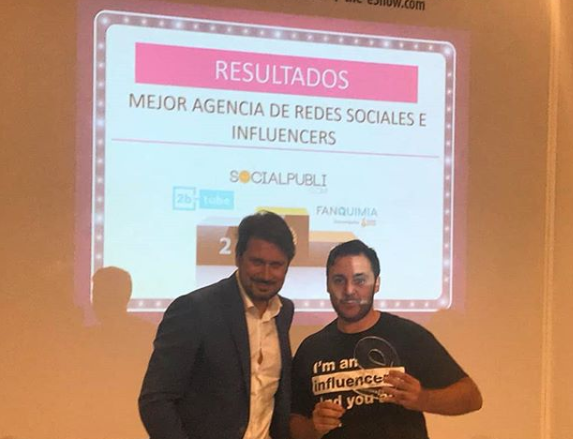 In order to help establish a more lasting relationship between the influencer and the advertiser, SocialPubli added a new section called “My Ambassadors”. After running a campaign, the advertisers can save a list of the influencers whose messages they liked most or who had the best results. This way, they can do future campaigns using only those influencers, who become their brand ambassadors. Although our focus is on microinfluencers, we also have top influencers and celebrities registered on our Platform and we ran personalized campaigns with them in 2018. Popularity is not the same as influence. Because of that, at the beginning of last year, we added a new feature which gives preference to the influencer accounts that received the most interaction. New campaigns are sent first to those influencers with the higher engagement rates and, in that way, those influencers are rewarded and the campaigns get better results. Even with all of this, the biggest event for SocialPubli in 2018 was one we organized ourselves, to present the Study we did with our influencers, in order to find out what they do on social media and what they think about the sector. Thanks to this Study, there were many advertisers and media who got to know u, and, of course, this meant more campaigns for us ! Here are some of the things we learned from the Study, which you can download HERE. 80% of our #influencers spend more than 3 hours on social media! On November 30th we celebrated the Day of the Influencer to the max. We gave out dozens of hats and t-shirts in two contests. One was with IG Stories, and the other was on Twitter. Happy #InfluencerDay! ???? Today we are celebrating your passion and influence the best way we can… with gifts! ???? Thanks to your influence and passion for what you do, we were a trending topic for hours. If there’s one thing that’s clear from all this…. It’s that next time we need a lot more bags, t shirts and hats! Let’s go for a 2019 full of even more success and celebrations!